EBCALA: Evidence Shows That Vaccines Cause "Mental Retardation"
Read Part 2, A Gypsy Moth Flaps its Wings and Part 1, The Wrong Narrative. Despite its name, the town of Cherryfield in Washington County, Maine, calls itself the Blueberry Capital of the World, and there is no disputing the claim. More than 90 percent of the world’s commercial blueberries are grown in Washington County, and Cherryfield is a major processing and shipping center. Machias, the county seat, hosts the annual Blueberry Festival every August. The festival puts on a musical, this year titled “Blueberry Fields Forever,” and a pie-eating contest – blueberry, of course. The area has a couple of other claims to fame. Washington County hugs the Atlantic Coast where the United States meets Canada, the easternmost point in the United States; the city of Eastport is the first to see the sunrise. The region is known as Down East. Two miles offshore is the island of Campobello, part of New Brunswick, Canada, where Franklin D. Roosevelt and his family spent summers. It was on his “beloved island” in August, 1921 – ninety years ago – that Roosevelt was afflicted with a paralytic illness diagnosed as poliomyelitis. But this remote and lightly populated area already had a significant history with polio – one of the first clusters in the United States occurred in Cherryfield a quarter-century earlier, in 1896 (we cited it in our list of pre-1910 outbreaks with links to fruits and vegetables). Seven children were affected, and one died. In all the discussion and theorizing about Roosevelt’s illness over the intervening decades, this convergence has been overlooked. At the dock, his family was waiting. His children played on the yacht through the adults’ cocktail hour, then were taken home while Franklin and Eleanor stayed for an elegant dinner on the fantailed aft deck, served by uniformed stewards. Three days later, on Wednesday, August 10, Roosevelt went to bed early in the cranberry-red cottage on Campobello Island, unusually tired and suspecting “a slight case of lumbago” (lower back pain). He had chills during the night, and in the morning one of his legs was weak; the paralysis had begun. By the next night, both legs were paralyzed. Because of the defining role it played in his life and, inevitably, world history, the days leading up to the attack have been dissected in detail by Roosevelt’s multiple biographers. Most historians believe he contracted the poliovirus on his visit to the Boy Scouts, which would have multiplied the chances of exposure to a youth with an active infection. Alternatively, he could have come down with the virus sometime between the Bear Mountain trip and his departure for Campobello. After his arrival at Campobello, much has been made of a fall overboard while sailing in the Bay of Fundy; of his typically energetic activities on the day he first felt ill, which included putting out a small forest fire on a nearby island and going for a dip with his children in a freshwater pond near his house. The “paralyzingly cold” water of the Bay of Fundy became an ominous metaphor for what was about to happen, but was never a serious biological argument. Since most victims were infants or children, the fact that Roosevelt was 39 at the time has also gotten attention. In 2003, a study in The Journal of Medical Biography proposed Roosevelt actually had Guillain–Barré syndrome, not poliomyelitis. [ii] While interesting, the evidence for such a diagnosis is not strong. Arguing against it is a comment by Elliott Roosevelt, FDR’s young son who was present when his father took ill. He and other children went on a previously planned camping trip – now without their stricken father -- because Eleanor wanted to keep them away from the risk of infection. Poliomyelitis remains the likeliest diagnosis: the timeline fits with an exposure at the Boy Scout camp. Estimates of the incubation period – typically a week or two, though that can vary considerably in either direction –match the Roosevelt scenario, no longer than 13 days. And Roosevelt’s presence in the world’s commercial blueberry capital at harvest time when his illness struck seems remarkable in light of the lead arsenate theory, which already had been proposed more than once in the decade before his illness. (Next year’s Blueberry Festival begins August 14.) Eleanor herself did the family’s grocery marketing in Eastport, and Roosevelt’s love of blueberries and other fresh fruit is well documented. 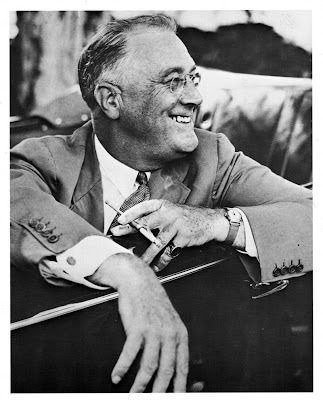 His chef in the White House, Henrietta Nesbitt, wrote that he was “fond of blueberry and other pies.”[iv] In the cafeteria at FDR’s presidential library in Hyde Park, the Henrietta Nesbitt Café, the most prominent picture is of the broadly grinning president being served a big piece of pie. None of this shows FDR eating a mound of fresh blueberries treated with lead arsenate in August 1921, but it seems more probable than not. Roosevelt famously survived polio, turning his personal tragedy into “Sunrise at Campobello” and leading America through the Great Depression and World War II, though his health flagged in later years as a result of his battle with polio. Some historians believe he was not up to the task of confronting Stalin at the Yalta conference that shaped the post-War world and led to the descent of the Iron Curtain and the Cold War. Roosevelt died in Warm Springs, Ga., in 1945, the retreat where he had worked valiantly to overcome paralysis and help others do the same. In death he became a symbol for the suffering of thousands of polio victims and galvanized the search for a vaccine. Sadly, despite the March of Dimes campaign he helped launch to find the cause and cure, polio outbreaks were about to get worse. Much worse. Dan Olmsted is Editor and Mark Blaxill is Editor-At-Large of Age of Autism. They are co-authors of The Age of Autism -- Mercury, Medicine and a Man-made Epidemic. [i] A particularly thorough account, which ours relies on, is in Kenneth S. Davis, FDR: The Beckoning of Destiny, 1882-1928. History Book Club: 2004. [ii] A.S. Goldman, E.J. Schmalstieg, D.H. Freeman et al. "What was the cause of Franklin Delano Roosevelt's paralytic illness?" J Med Biogr. 2003 Nov;11(4):232-40. [iii] Elliott Roosevelt and James Brough, An Untold Story – The Roosevelts of Hyde Park, Dell Publishing, 1974. As for the movie "White Springs"...just one more CDC-led fear-mongering flick among a host of hundreds, if not thousands of CDC sanctioned "science" fiction works. Sure FDR could think of picking up Polio virus from a short photo-op with "polio-infested" water or Boy Scouts, but come on how many dozens, or hundreds of other unsubstantiated claims are accepted as the gospel truth especially those that are the clear by-products of CDC propaganda efforts to contort the truth into vaccine-manufacturing drug company fashions? FDR knew the Campobello Island area intimately. He was there from infancy. Most of his years were spent there, three months at a time. Are we really to believe that FDR never was exposed to Polio before the photo op? Ever? 1. The difference in FDR & his children's symptoms could have been in the fire fumes. Obviously his children were not fighting a fire. Who knows what the fire area had been treated with as far as chemicals? Eleanor was already fuming at Franklin. She had busted him after for having a sexual relationship with her assistant, Lucy Mercer. He wanted to dump Eleanor completely, but *his* mother threatened to cut him off without a penny if he did. A smart woman would have the common sense to make sure he wasn't going to anywhere in his 'neck of the woods' alone. Eleanor agreed to stay legally-bound to FDR, but she banned him from their bed forever. But did she know something that he didn't know she knew about this "family" time? On the "jog" did the party ever lose sight of FDR for an extended period of time? Did he slip behind some trees for a quickie with his mistress, then take a short cut he knew about? And what about the "mysterious" fire? 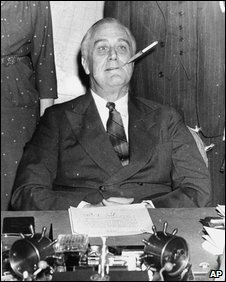 Did FDR come about to a deserted island and fight the flames with lots of help because they were slaking his "Lucy Mercer Love Nest"? Who knows? The problem with FDR is there is public history, but there is also a very clandestine history of a man that hid his crippled state in plain sight of the entire world. Maybe the night before he'd slipped off in a canoe on a secret mission to destroy more private love letters by burning them on the deserted island. Maybe the fire smoldered over night and became out of control the next day...? Maybe Lucy torched the place when their rendezvous was foiled by Eleanor? Could this whole thing be actually been related to just another rich-rich elitist gent covering up his tracks for breaking Gladstone's whimsical eleventh commandment "thou shall not get caught"? Could Eleanor have used a bottle of moth killer to poison FDR from the waist down. As an elitist was she privy to the unpublished industry data on Polio, or if interested, could she have access to some of the very same period stuff Mark and Dan have drummed up? 2. The fact that FDR had been in the area before and had fought fire there before, and took a dip afterward, still doesn't address whether the burnt areas had been chemically treated, and when, if any, chemical treatment had started, and whether areas where he had previously fought fires had been treated. FDR grew up during the "first" Polio "epidemic". Polio was nothing new. He spent plenty of summers at Campabello Island. A better question is how did he avoid being a "moth theory" victim for thiry-eight years? 3. If lead arsenate could possibly interact w/polio virus and make it much worse, is there the possibility that it could have a similar exacerbating effect on other microbes, for instance one that could causing G.B. syndrome? And if so, whether G.B. or polio was FDRs downfall becomes a moot point. Don't get the wrong impression. Mark and Dan have done a pretty good job of pointing out that Polio and every other virus on the face of the earth have been here since the beginning of time. We have viruses all around us, but they don't hurt us because they are too few in number, or we have developed immunity to them. The necessity of vaccinations has always been in doubt for this very reason. It is always better to have a natural exposure than an artificial exposure that needs boosting and boosting again and again. Yet that very elusive laboratory immunity is against all nature, and mostly likely never to be resolved. Specifically, this is a case of contention based on evidence-based science. The 2003 study was manna from heaven for victims of vaccine injury. The risks the authors took in telling the truth did stop short of implying the source of FDR's Guillain-Barre Syndrome affliction was a vaccine or one of the numerous inoculations widely available at that time, but there is zero reason for their findings to be rejected as the next logical step is to associate the case with vaccine injury, as is almost always the case with GBS. Exact disease incidences and symptom probabilities are not known. When disease incidences were artificially changed in favor of polio to values that were still somewhat realistic, six of eight key symptoms still favored Guillain-Barré syndrome. The only symptom that was somewhat sensitive to changes in symptom probabilities was fever. However, the reasonable change in the symptom probabilities caused the presence of fever to favor Guillain-Barré syndrome. Unfortunately, Roosevelt's cerebrospinal fluid was never examined. The number of leukocytes is increased and concentration of protein is usually normal in the cerebrospinal fluid of patients with polio. The converse occurs in Guillain-Barré syndrome. Polio may be caused by chemicals and the Polio virus, but it doesn't change the facts that somebody was getting vaccinated way back when. Where did all the vaccines being produced back then go? Since FDR had Guillain-Barre Syndrome we most likely know where a few of them went. @media scholar - really interesting details, although not necessarily to change my mind re: the possibility of lead arsenate (toxic metals) interacting w/microbes to increase the severity of a body's reactions. 3. If lead arsenate could possibly interact w/polio virus and make it much worse, is there the possibility that it could have a similar exacerbating effect on other microbes, for instance one that could causing G.B. syndrome? And if so, whether G.B. or polio was FDRs downfall becomes a moot point. It's all about the underlying causative combination of microbes and toxins, in various combinations, and whether the complete immune system is strong enough to deal with it. Just recently from a research trial up from UofM and Duke, they exposed folks to the flu virus. Some of them showed classic flu-like symptoms. The others did not. But upon testing, all participants' immune systems showed activation to the exposure. The asymptomatic responders had a much more "tightly" regulated response. If that is possible w/the flu, why wouldn't it be possible for other infections? What's more, I think the implications of this research are astounding and under - reported considering it flies in the face of the premise that we need such high uptake in vaccinations. People don't get vaccines for trips to Canada. And suggesting that all of FDR's children's stiff necks could have been psychosomatic or the result of changes in sleep posture is far-fetched. Furthermore, it was explained that FDR's exposure to a boy infected with polio combined with the fall in cold water could have made him more susceptible to the virus than he was on all of the other family trips to Campobello. Lead arsenate in his food - a possible co-factor in contracting polio - could have been the tipping point. Your own research showed that adults over the age of 30 were stricken with polio, albeit infrequently. As for GBS, "constant exhaustion, tiredness and pain in the back of head are early signs of Guillain Barre Syndrome." This wasn't the case with FDR. In 2003, a study in The Journal of Medical Biography proposed Roosevelt actually had Guillain–Barré syndrome, not poliomyelitis. [ii] While interesting, the evidence for such a diagnosis is not strong. Unfortunately, the link provided with this third part does not work. Please read the entire study as it indicates the STRONG likelihood that FDR, in fact, was more likely to have contracted Guillain-Barre Syndrome and not Polio as Mark and Dan seem to suggest. Summary: In 1921, when he was 39 years of age, Franklin Delano Roosevelt contracted an illness characterized by: fever; protracted symmetric, ascending paralysis; facial paralysis; bladder and bowel dysfunction; numbness; and dysaesthesia. The symptoms gradually resolved except for paralysis of the lower extremities. The diagnosis at the onset of the illness and thereafter was paralytic poliomyelitis. Yet his age and many features of the illness are more consistent with a diagnosis of Guillain–Barre´ syndrome, an autoimmune polyneuritis. The likelihoods (posterior probabilities) of poliomyelitis and Guillain–Barre´ syndrome were investigated by Bayesian analysis. Posterior probabilities were calculated by multiplying the prior probability (disease incidence in Roosevelt’s age group) by the symptom probability (likelihood of a symptom occurring in a disease). Six of eight posterior probabilities strongly favoured Guillain–Barre´ syndrome. "...The diagnosis of poliomyelitis in FDR’s case was never questioned. Indeed, it seemed ﬁtting, because poliomyelitis was epidemic in the north- eastern United States where FDR lived during the late nineteenth and early twentieth centuries. At the time, poliomyelitis was one of the few recognized causes of ﬂaccid paralysis. ..."
Against this, Mark and Dan poo-poo GBS because the Roosevelt children had stuffy noses, slight fever, and neck cramping? That is not extraordinary for firefighters, smoke-jumpers or simple campers. Musty tents or cabins, possible smoky campfires or ill-ventilated fireplace fires, or even chicken feather pillows can be triggers for a stuffy nose. Slight fever? Anybody for seasonal allergies here? Allergies typically carry a slight fever with them. The nose runs to flush out something taken in via the air. Stiff necks? Well, they are Roosevelt's...(two, three, four bah boom),but seriously with Eleanor harping "it's Polio, it's Polio", the changes in sleep posture, or the stress itself triggered by the "vacation from hell" a natural sense for kids may likely to have been to exhibit a whole-body let-down triggered by fear, or perhaps sympathy pains for their dad, who they hurt for. "...Most symptomatic cases of poliomyelitis occurred in young children and were characterized by a mild, brief febrile illness. In a much smaller number, a second phase appeared that was marked by fever, headache, meningeal irritation, muscle soreness in the neck and back, and a ﬂaccid, usually asymmetric paralysis. The preponderance of the disease in children was demonstrated during one of the peak epidemics (1916) in New York City, when 1469 per 100,000 children aged one to four years and only 2.3 per 100,000 adults aged 35 to 44 years developed paralytic poliomyelitis. ..."
None of the Roosevelt children were paralysed as a result of the vacation. "...To summarize, FDR’s paralytic illness was marked by: an ascending, symmetric paralysis that progressed for about 10 to 13 days, facial paralysis in the absence of other cranial nerve abnormalities; prolonged bladder and bowel dysfunction; numbness and protracted dys- aesthesia; fever at the onset of the paralysis; a slow and symmetric partial resolution of the paralysis in a descending fashion; and permanent, nearly symmetrical paralysis of the lower extremities. Few adults who contracted paralytic poliomyelitis in the ﬁrst part of the twentieth century were older than 30 years. Fever, permanent paralysis and transitory bladder dysfunction are common but fever usually begins before the paralysis in poliomyelitis and the bladder dysfunction rarely lasts for more than a few days. Furthermore, ascending, symmetric paralysis, facial paralysis in the absence of other cranial nerve abnormalities, obstipation, numbness and dysaesthesia are unusual or absent in paralytic poliomyelitis. In that regard we found only one report of ascending, symmetric paralysis in poliomyelitis. ..."
"...In contrast, all of FDR’s neurological abnormal- ities commonly occur in GBS. His paralysis was brieﬂy unilateral but that is not unusual in the early stages of GBS. Minor degrees of asymme- trical paralysis, as found in FDR’s case, are also common in GBS. Fever is uncommon in GBS but has occasionally appeared at the start of the neuritis. Few features of FDR’s illness were consistent with other causes of ﬂaccid paralysis. The pure motor axonal form of acute polyneuropathy was excluded because of sensory abnormalities in FDR’s disease. Chronic inﬂammatory demyelinating polyneuropathy was unlikely because the progression of the disease was not long enough in FDR’s case. The Miller–Fisher variant of GBS was unlikely because of the lack of other distinguishing features, such as ataxia and ophthalmoplegia. Botulism was ruled out because there was no evidence that others in thefamily were exposed to food contaminated with the causative agent. Furthermore, the paralysis due toClostridium botulinum is typically descending, and sensory abnormalities are uncommon. Diphtheritic polyneuritis seemed improbable because of the absence of a membranous pharyngitis within two or three months before the paralysis, the lack of palatal palsy, and the lack of the toxic appearance associated with that disease. ..."
"...The inconsistencies in the diagnosis of polio- myelitis are as follows. Paralysis due to poliomyel- itis is rarely symmetric or ascending and usually progresses for only three to ﬁve days. Facial paralysis is uncommon inpoliomyelitis when other cranial nerves are not involved. Fever in paralytic poliomyelitis usually precedes the paralysis. Meningismus is common in paralytic poliomyelitis and was lacking in FDR’s case. Numbness is very rare in poliomyelitis. Pain in poliomyelitis is due to myalgia rather than dysaesthesia, which was found in FDR’s case. A descending, symmetric recovery from paralysis, as FDR experienced, is rare in poliomyelitis. Another reason to question the diagnosis is the epidemiological pattern of paralytic poliomyelitis in the United States during the early twentieth century. At that time, almost all cases of the disease were in infants and children of pre-school age. During the 1920s, schoolchildren were also prone to the infection but adults were at much lower risk. In 1921, few adults older than 30 years contracted paralytic poliomyelitis. ..."
"...The disease that most closely resembled FDR’s illness was GBS, an immune-mediated attack on peripheral nerves due to molecular mimicry between foreign microbial antigens and self-antigens that is particularly common in adults. In that respect, certain infections, including Campylobacter jejuni, cytomegalovirus, Epstein–Barr virus and Mycoplasma pneumoniae, often occur several days before the onset of GBS. Cross-reactivity of IgG antibodies to C. jejuniwith GM1gangliosides on nerve ﬁbres may be the commonest cause of GBS. Each neurological feature of FDR’s illness was consistent with GBS. Landry’s ascending paralysis is frequent in GBS. A symmetric pattern of paralysis is usual but seldom absolute. Moreover, meningismus, though common in paralytic poliomyelitis, was not found in FDR’s case and is rare in GBS. The aching discomfort (‘‘lumbago’’) that FDR felt on the ﬁrst day of his illness is common in GBS, and poliomyelitis. Numbness occurs commonly in GBS and not in poliomyelitis. Furthermore, dysaesthesia occurs in about 47% of patients with GBS, but is rare in poliomyelitis. ..."
GBS, GBS, GBS. This study concludes that Polio can not be ruled out, but it strongly suggests by scientific analysis FDR was crippled by Guillain-Barre Syndrome contrary to popular knowledge. When the League of Nations formed up in 1919 a Health Organization featuring three bodies was established. Among their goal-oriented objectives was mass vaccination policy for the entire world. Of interest, Canada was a member of the League of Nations in 1919. The United States was never a member. Centuries before Canadian lore includes frontiersmen making "blood brothers" of each other. This included arm to arm variolation (deliberate infection with Small Pox). Time later it only makes practical sense that Canada was foremost on the cutting edge of League of Nation mandates for mass vaccinations. 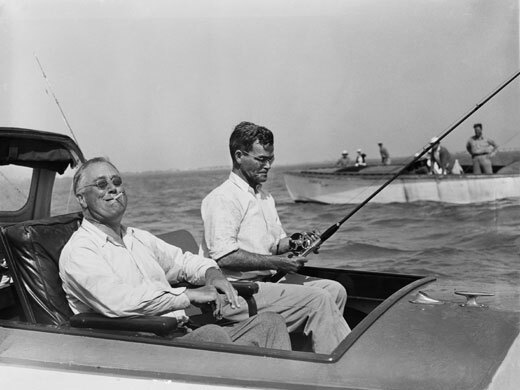 Finding out what FDR's recent shot records just prior to the vacations would be nice. It's an educated guess with high probability of correctness to suggest that the Roosevelt's had vaccines for the whole family before they ventured north of the border. The family reaction to FDR's affliction after his illness is indicative of strong believe in vaccination. The "moth theory" doesn't make good sense. FDR grew up in the exact period this series describes, yet was 39 when moth illness theory struck. How many years prior did FDR and the family do the exact same thing upon their visit to Campobello Island yet no Polio each and every prior visit? FDR said the authorized dip he took after fighting the fire didn't envigorate him as in the past. That means they'd been there before. Eleanor was a very powerful, strong-willed lady. Let's not forget she was given away into marriage with FDR by the President of the United States. Events leading to FDR and his relationship to Eleanor led him to become glow in the dark "radioactive" in her eyes. Lucy Mercer comes to mind. Is it a far-flung idea that Eleanor might have been smart enough or behind the scenes knowledgible to figure out what was causing the Polio epidemics? Did she quietly purchase a bottle of gypsy moth killer ahead of the family trip and try to poison FDR from the waist down? In contrast, the evaluation of FDR's medical records suggest that FDR had Polio is a bit of a myth. It doesn't exactly point a finger at vaccines, but we all know that Guillain-Barre Syndrome is synonymous vaccine injury. Perhaps medical school needs to incorporate research and coursework on Metals Mixed with Microbes, in this case two metals. Makes me think of how we are injecting our children with mercury and aluminum, preceding or simultaneously with a few live microbes. I keep thinking of Dr. Boyd Haley's explanations of synergy, i.e. the amount of lead that kills 1 in 100 rats mixed with the amount of mercury lethal to 1 in 100 = all 100 die. How many adverse disease outcomes also involve a toxic environmental load? What if the answer is nearly all of them? Were the fires he fought in an agricultural area which had been treated w/lead arsanate, which he would then have been breathing in, in addition to ingesting it if he was eating fresh fruit? Vitamin D3 levels, which are very important for the immune system, are known to drop significantly after surgery (trauma) to the body. Fevers above a certain temperature are believed to help a body clear infections. Could his body have become too cold from falling in water to effectively clear the infection. Possibly, but I can't imagine all polio victims experienced sudden timely cold. Maybe could have been a minor role, if any. There is a well documented connection between polio and physical exertion. 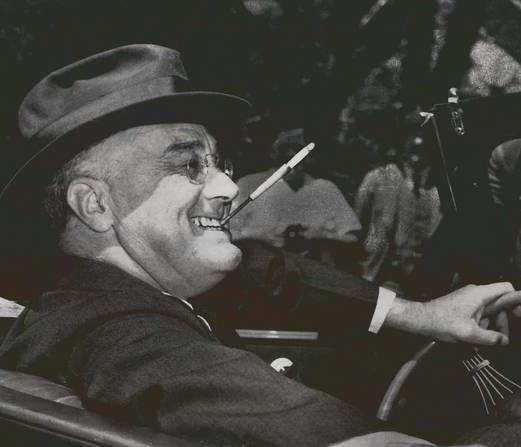 To add to the immune overload, the fires FDR had to put out likely contained toxic fumes. There is also a well documented connection between polio and insulin. There was a famous experiment in the South by Benjamin Sandler in the 1940s that showed that limiting sugar intake lowered polio infection rates. So the blueberry pie could have been a double whammy. I have attended many patients over the years who contracted mild cases of poliomyelitis in early childhood. Interestingly, many of them report a traumatic injury, such as a moderate-to-serious fall or crash, just prior to the onset of clinical sequelae. Such injuries are known to tax the immune response, often overloading an already-delicate system. Fascinating. This got me googling. The cold stress caused by the fall in the chilly waters could have made Roosevelt more vulnerable to the polio exposure he'd had a few days earlier - causing him to become much more ill than his children were, who had similar but milder symptoms. Also, cold stress causes increased food intake (which would include blueberry pie laced with a lead arsenate insecticide). It would be interesting to determine if Roosevelt's fall into the cold water caused hypothermia (mild or otherwise). "Although it has not been vigorously studied, the effect of a decrease in either peripheral or core temperature on the immune response is very important in a field situation. Limited studies suggest that cold inhibits many of the immune responses." An interesting google tidbit - FDR is a descendent of John Howland - the man on the Mayflower who fell overboard. Psychological stress also suppresses the immune system. Roosevelt was putting out a forest fire the day he fell ill. It seems everything lined up aganst FDR that week. This episode brings to mind President William Henry Harrison who died one month after giving his two-hour inaugural address on a cold day - without wearing a coat or a hat. He caught a cold which turned into pneumonia.